The last couple of days, since we turned over the hull, has involved putting in forty huundu along the entire inside seam between the bottom and side planking. This was mostly my job, with Shimojo san joining me to do a few. Otherwise he and his son fitting and installed the bow transom. Then yesterday Shimojo san and I started fitting the stern transom. The huundu inside need to bisect the angle between the bottom and side, and one just has to be conscious of chiseling that angle correctly. Shimojo san laid out the fastenings to lie in between the ones on the outside of the hull, making small adjustments now and then to avoid a large knot. At the very hood end of one of the bottom's side timbers, he made a custom huundu that spanned the tiny end of the timber. He explained that this small amount of wood might crack under the wedging action of the fastening, so the middle of the key is straight. Of course, these timbers are all glued together so in effect they are like one solid piece, so…. But I've noticed that Shimojo san's reasoning always comes from the pre-glue days. He spent most of his career not using the stuff, so he isn't going to change his fundamental methods now. I would say it was about six hours of labor for me to install the forty huundu. As you can see, as always our rough cut stock has plenty of extra material. 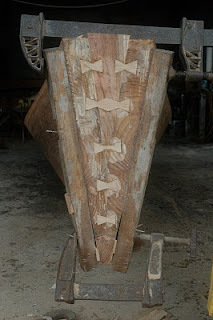 After fitting the bow transom, using the saw in the joint, the transom was glued in and huundu installed in the face. Note more special fastenings to deal with this area. The bow and stern transoms are four inches thick. We removed all the hardware that had kept the stern spread, replacing it with a wooden bar forward of the transom so we could work. The transom fit quite closely with its rough bevel. It got too dark yesterday to continue (a rainy Christmas Day) but I suspect today we will have this fit and glued in pretty short order. Shimojo san and I talked at break yesterday and he told me that he has material for two more sabani, and his plan is to very slowly build them on his own schedule, and then he figures that's it. He realizes that physically this has become a bit too much (anyone else would have said that to themselves years ago -- his stamina and determination are amazing). Anyway, it was sad to hear him talk like this, and it made me feel ever more grateful that I had this opportunity to work with him. I visited my two Tokyo teachers on my way here and it was sobering to see how both men have aged. They were in their seventies when we worked together (and they could both have worked circles around people half their age). They are in their eighties now and no longer active. At this point the majority of the fifty or so boat builders I have met over the years in Japan are in their eighties. I don't know a boat builder under seventy, in fact. Douglas, you are a fortunate man. This boat is simply amazing and so are the people. Seeing a boat fastened so well - with no fasteners - is inspiring and gives me cause to think that civilization has done little to advance the art of boatbuilding, when such simple technology works so well. Please extend my gratitude to Shimojo san! I know Mr.Hirosi Tajiri 48years old. He is living near Nagara river building riverboat for UKAI. many FUNAKUGI for thei constraction. To respond, in a way to both these comments. One of the real problems facing traditional boat builders in Japan today, as well as anyone wanting to build a boat in the traditional fashion, is the difficulty of finding boat nails and some of the specialized tools. It is easy to forget that as a main craft disappears so often do the craftsmen who supplied it. This is certainly true of boat nails. I know of perhaps only two sources left nationwide for traditional boat nails, hand made of flat steel stock. So the sabani is very interesting in that the boat builder is completely independent of these suppliers, since he/she can make his/her own fastenings from hardwood and bamboo. No doubt the tradition of using huundu, the wooden fastening, in Okinawa was in part the cost of metal nails many years ago. Now that the nail makers have almost disappeared, the sabani builder has the last laugh.